For three weeks the wholesale and foodstuff specialist METRO will welcome the public as well as customers and partners to its own pavilion, "METRO unboxed", as part of the düsseldorf festival! The German company will introduce itself to the public after its stock market launch in July at the pavilion. NUSSLI planned and executed the sustainability-inspired brand pavilion and created an interactive area which includes an observation tower in the heart of Düsseldorf. 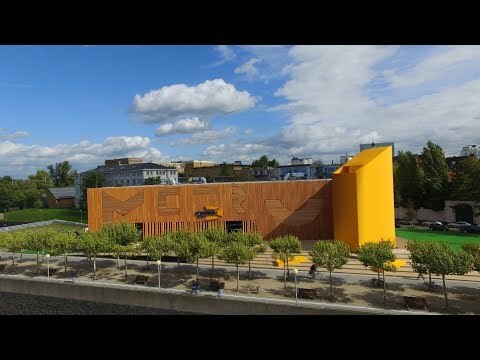 Within only a few months, the NUSSLI project team implemented the two-story building with an exhibition and the "METRO-One" observation tower in the form of the Metro logo. The NUSSLI team was also responsible for the construction of the exhibition pavilion which was designed by Milla & Partner. The objective was to provide the various exhibition furnishings, kitchen installations, graphics as well as partitions between the stations according to the customer's wishes. In order to be able to build a pavilion with an area of 2000 square meters and sophisticated interior fitting within a strict deadline, certain prerequisites must be met", according to Otto Schweitzer, project manager at NUSSLI.﻿ "Seamless collaboration is important for all project participants as well as a network of reliable partners. The interfaces are to be meticulously defined and the processes must operate smoothly and efficiently. Moreover, we have the fundamental advantage of being able to outfit all the construction services from a single source, for instance, steel construction with system elements for building the pavilion as well as the entire exhibition construction. We coordinate internally on a regular basis, and even begin manufacturing the modular components in our own production facilities as early as the planning phase. ﻿The exchange of information is carried out efficiently, and our processes are well-honed. These measures save us a lot of time and offer the customer flexibility. The interactive exhibition, "METRO unboxed" includes 38 stations in which visitors can experience "the new METRO" with all their senses. Furthermore, they have the opportunity to step into the world of modern commerce, become familiar with international specialties and sustainable logistic solutions as well as digital trends for the future. Visitors will be surprised and inspired by the latest technologies within a hands-on and interactive space. What's more, while the artists perform outside on the plaza or in the pavilion's forum, there are cooking demonstrations, panel discussions and much more to round out the impressive itinerary of the düsseldorf festival! The METRO pavilion's 16-meter-high observation tower will be completely dismantled after the end of the exhibition. ﻿The system material used for the substructure of the pavilion and the tower will be further used in other temporary buildings upon its deconstruction. Even the wooden exterior facade of the interactive area will be recycled. Components of the interior fitting will likewise be used in other ways whenever possible or recycled.